Rinse, de-stem and roughly chop Cauliflower. Spread all vegetables on a cookie sheet and drizzle with Olive Oil. Toss to coat and sprinkle with salt and pepper. Roast vegetables at 450 degrees for 20 minutes until just beginning to brown. While your vegetables roast, cook your pasta or veggie noodles. In a medium sauce pot, begin to heat your favorite Cannizzaro Sauce. Add your vegetables and toss to combine. 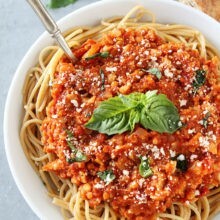 A meat-free but a very hearty version of Bolognese sauce!